Notification No. F.1/37/009-SCA dated 16th January 2019 regarding Chief Justice Of The Supreme Court Special Judicial Allowance 2019 three times of Basic Pay 2017 by the honorable Chief Justice of Pakistan. In pursuance of Finance Division’s U.0...511142-3/2018 dated 29.06.2018, In response to this Court's letter of even number dated 06.06.2018 the Honorable Chief Justice of Pakistan has exercised powers in terms of Finance Division's expenditure Wing) 0.M.No.F.11502.12/81 dated 24. 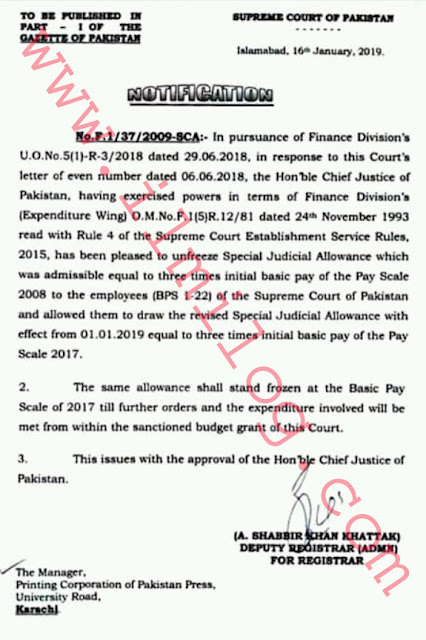 November 1993 read with Rule 4 of the Supreme Court Establishment Service Rules, 2015, has been pleased to unfreeze Special Judicial Allowance which was admissible equal to three times initial basic pay of the PayScale 2008 to the employees (BPS I-221 of the Supreme Court of Pakistan and allowed them to draw the revised Special Judicial Allowance with effect from 01.01.2019 equal to three times initial basic pay of the Pay Scale 2017. 2. The same allowance shall stand frozen at the Basic Pay Scale of 2017 till further orders and the expenditure involved will be met from within the sanctioned budget grant of this Court. 3. This issues with the approval of the Chief Justice of Pakistan.